I'm sharing a card using this sweet Fairy image from Whimsie Doodles called HEART FAIRY and she is in the What's New Section , I just think she is adorable, I also used the color swatch for the challenge at Whimsie Doodles. I colored her with copics and used my MFT dies for the banner and background piece, C.C. designs die for the banner and the heart die is from Lawn Fawn and a little twine to add interest to the heart. 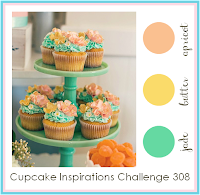 Here is the color palette for the challenge, how spring/summery are those colors, I love the mint/orange combo! 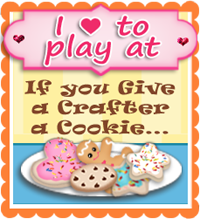 I love Whimsie Doodles and your card is fab! Thank you for sharing with us this week at Cupcake Inspirations. That is such a pretty color combo!! I love the wonderful design of your card Sharla and your coloring is awesome! Thanks so much for joining us at Kraftin' Kimmie for Wonderful Wednesday. P.S. I agree with you...we should have more weekend time!! Hi, Sharla. Don't know how I stumbled on your blog, but glad I did, because I am blown away by your cards and this one is of em. I love this color combo and that girl is so adorable! I am amazed at your coloring skills! I'm still learning how to copic color, so I hope I'll be just as good as you soon. 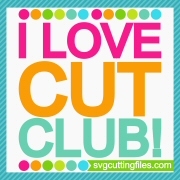 :) I'm off to look some more at your other posts. Have a great weekend! Beautiful card, flawless coloring! Thanks so much for joining us at the Marker POP challenge! What a beautiful card made for our challenge at Pile It On! Thank you for joining us and for making this amazing creation. I hope you will join us again soon. Beautiful card, Sharla! 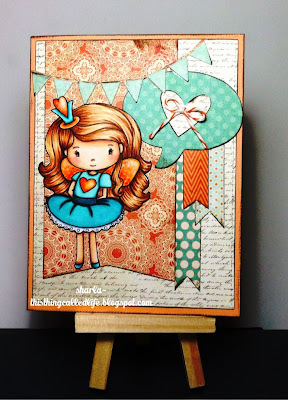 Love the colors, layers and cute image! Thanks for joining us for the Little Miss Muffet Challenge!